The first 17 pages of the Private Pilot PTS are packed with a mind-numbing number of details. It’s easy to skim over this section, thinking that the meat of the document is a bit further in. But wait! There are are some very important concepts and requirements included in the introduction that you must be familiar with in order to successfully navigate the exam. Applicant – a term you will see throughout the PTS. As you are applying for a pilot certificate, you are referred to as the applicant. Organization – The Practical Test is organized into Areas of Operations, with each area consisting of one or more Tasks. For example, the first area of operation is Preflight Preparation, which includes Certificates and Documents as the first task. 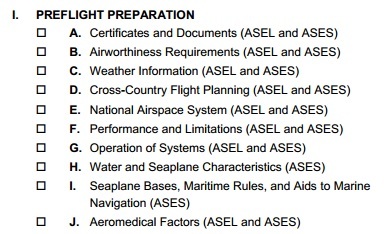 Oral Before Flight – The oral (or ground) portion of the exam must be accomplished prior to the flight portion. However, the examiner can and will continue to ask you questions throughout the flight portion. ASEL – Airplane – Single Engine Land. Some Areas and Tasks are only required for other classes (such as Airplane – Multiengine Land). You only will be tested on tasks that apply to the airplane class for which you have applied. Plan of Action – The examiner will develop and use a plan of action that serves as a script for the conduct of the practical exam. The plan of action will contain one or more scenarios that are used to sequence as many tasks as possible efficiently, while also providing an opportunity for the examiner to evaluate applicant risk assessment and judgement. You should review this example plan of action. on time the next morning. Two of the passengers are planning to stay overnight. Evaluation of tasks – Any task selected for evaluation during a practical test shall be evaluated in its entirety. This has a couple of considerations. First, if the outcome of any task is uncertain, for instance because the examiner was distracted because of a traffic call and was not able to observe your performance, the examiner will ask you to repeat the task. This allowance is not to be used to give you a second shot at the task if your first attempt did not meet the required standards. Applicant’s Use of Checklists – The examiner will be closely watching to ensure that you effectively use a checklist for each phase of flight. As you are using a checklist provided by your flight school, it is your responsibility to ensure that it includes all of the approved manufacturer’s checklist items. Compare the checklists in Chapter 3 and 4 of your airplane’s AFM to ensure all checklist items are included in your training checklist. Use of Distractions during Practical Tests – The examiner will use subtle distractions in an attempt to assess whether you are easily distracted. Examples might include asking you questions during the preflight inspection, which could cause you to omit required checks. In flight, the examiner may attempt to distract you by asking you questions or to perform simple tasks, but during a critical phase of flight. Reminder, examiner is assessing whether you are demonstrating Pilot In Command authority; if you need the examiner to stop talking so that you can focus on piloting tasks, let him know that, just as you would inform any other passenger. If the examiner asks you to pick up a pencil that he just ‘dropped’, assess whether you and the airplane are in a good state for you allocate workload to that task. Positive Exchange of Flight Controls – During the practical exam, the only time that the examiner typically assumes control of the airplane is during the recovery from unusual attitudes. Ensure that during this exchange, and every other exchange, you initiate and ensure compliance with a three-way handshake, both visually and orally. Stalls and Spin Awareness – During your training as well as during the practical, all stalls and their associated recoveries will be performed such that the aircraft is never less than 1,500 AGL. If the examiner asks you to perform a stall below this altitude, he is really checking your situation awareness; you should inform the examineer that you are below the required altitude and climb to a safe height in which to perform stalls.